Wargamingnz: Talk about Lady Luck? Some great HotT action. Talk about Lady Luck? Some great HotT action. It has been a while since I played any HotT, so Nick G popped around and we thrashed out two cool games. In the first I fielded the Victorian Science Fiction army, lead by none other than Major General Caruthers, and featuring that debonair inventor and adventurer Lord Chelting of Cheam with his wondrous flying machine, and downy faced young hero of the Empire Lieutenant Winstanley. Their foes were a sinister Sarmatian horde fresh from the foreign steppes. Lord Chelting bravely flew into the rear of the enemy only to be confronted by a fearsome dragon. In the meantime the main Sarmatian line (all knights!!) struck hard at the British line. 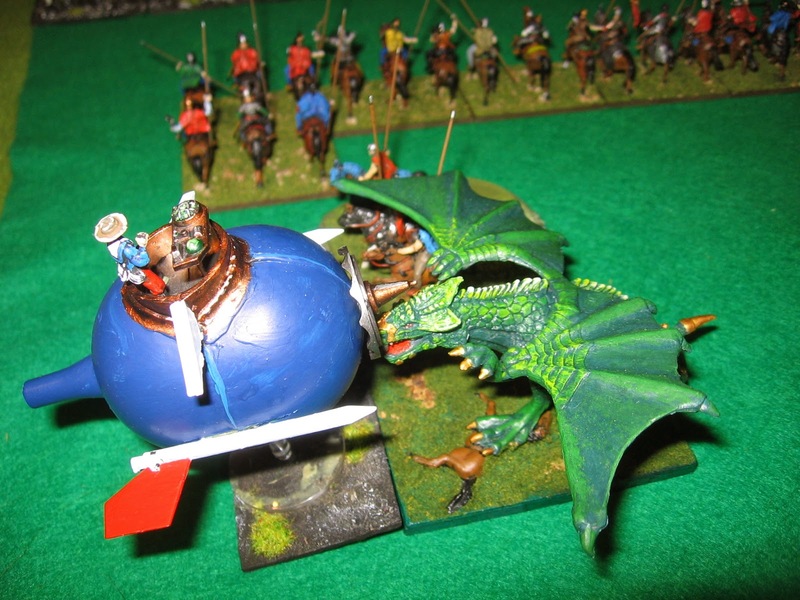 Meanwhile the battle royale continued in the skies above as the dragon pursued Lord Chelting. Chelting turned to face his fierce-some opponent and, in a tussle that would be talked about for decades to come, a battle that would see Chelting labelled as the new Sir George, drove the dragon from the field. 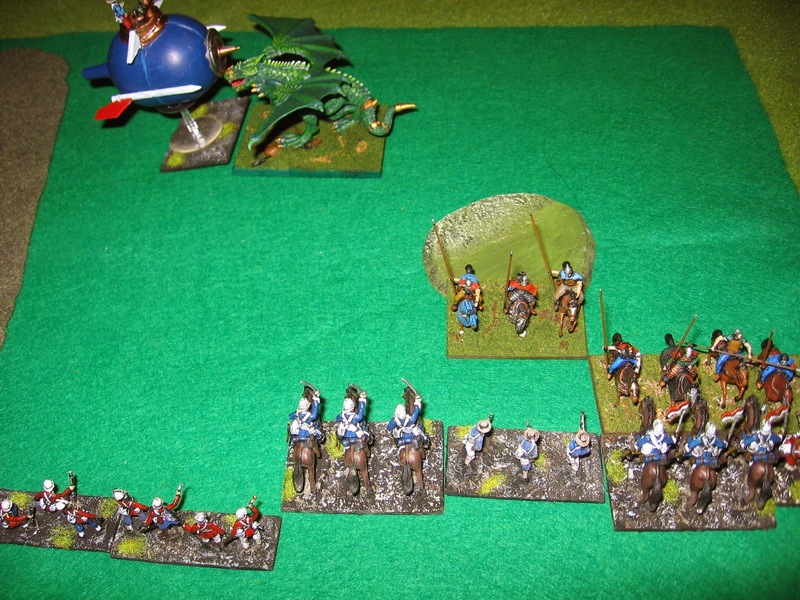 The battle continued along the line, with unit after unit of knights succumbing to British might. And so it ended, the Sarmatian host driven from the field of battle. Caruthers would be writing a glowing despatch to Horse Guards this night. In the second battle, I took my 'Lost Worlds' army against Nick's Undead. Nick's aerial hero struck hard and fast on the LWs left supported by a flyer. The LWs behemoth managed a combat draw, allowing the rest of the LWs line to advance forward out of the way. It wouldn't have been pretty if the behemoth had been tumbled back. Meanwhile the Undead line attacked. And then some interesting 'argy bargy' again on the LWs left flank, the Undead beasts destroyed by a ferocious counter-attack. Two really interesting games, but I have to say they went perhaps unfairly to me in both cases. Nick's die rolling as such that he won a mere THREE combats in the entire two games. Even when he set up combats with good odds he was at best getting draws, but more combat often losses. With my Lost Worlds army the great gorilla god failed to show, and yet the army was still victorious. Good fun, but somehow I know that the Gods of Luck will play with me next time, and Nick will have his revenge. It was a great evening. Nice beer, stimulating conversation and silly games all in the setting of a glorious 100 year+, quarter acre centre city setting.